As a key driver of productivity and innovation, industry has always been a cornerstone of economic prosperity in Europe. We can rely on a strong industrial base, but important efforts are needed by Member States, EU institutions and most importantly industry itself to maintain and reinforce Europe's industrial leadership in the age of globalisation, sustainability challenges and rapid technological change. President Juncker's Political Guidelines have underlined the importance of a strong and high performing industry for the future of Europe's economy and the need to bring industry's weight in the EU GDP back to 20% by 2020. Industry provides 36 million direct jobs 1 , contributes to high standards of living for our citizens. It plays a key role in supporting Europe's global leadership and international stature. The President of the European Parliament has also only recently again recalled the importance of Europe's industrial base as key focus of our policies 2 . Europe is the global leader in many industries, especially in high value added, low carbon and sophisticated products and services. This position has been built on a large Single Market with 500 million consumers, strong value chains, a skilled and talented workforce and a world-class science base. However, major efforts are needed to adjust to the challenges and reap the vast opportunities of the new industrial age 3 . The hallmarks of this new industrial age are the accelerated pace of economic, societal and environmental transformations as well as technological breakthroughs in areas like robotics, Internet of Things, artificial intelligence, energy systems and bio-economy. Automation, enabled by information technologies, is transforming traditional manufacturing processes and the nature of work. Industry is increasingly integrated in global value chains with strong service components. Emerging business models disrupt traditional markets. Innovation itself and value creation are changing in profound ways, driven by a new generation of consumers who expect value-co-creation, connectivity and real-time performance measurements. This also is blurring the distinction between manufacturing and services. Data are becoming the new competitive factor in our connected world. And with strained natural resources and climate change becoming an ever more tangible reality, demand for sustainable products and circular consumption will increase exponentially. These trends are real and irreversible, and industry is starting to seize the opportunities they present. EU industry has been able to reverse the decline in the EU industry's export market shares and in the share of industry of total value added. The market shares of EU exports are gradually increasing for goods and stable for services. Industry gross value added for the EU27 4 has increased by 6.4% between 2009 and 2016 and by 4.7% for the EU28. The contribution of manufacturing industries and manufacturing inputs from the extractive industries and utilities industries to total value added accounted for 21% in the EU27 (19% in the EU28) in 2016 5 . Manufacturing added value alone has grown by 25% in EU27 (23% in EU28) in real terms since 2009, its share as a proportion of the economy has increased from 15.5% (14.7% in EU28) to 17.1% (16.1% in EU28). The decreasing trend of employment in industry has also been reversed. Between 2009 and 2013, industrial employment decreased by 1.8 million (5.4%) in the EU27, but since 2013 over 1.5 million net new jobs have been created in industry. In manufacturing, jobs have grown at an even higher rate, predominantly in higher-paid engineering, professional and management jobs 7 . The growth in industry value added and employment is also reflected by an annual growth rate in labour productivity in EU industry of 2.7 % on average from 2009 to 2016. EU labour productivity growth compares favourably to other major economies such as the US (+0.7 % per year on average 2009-2015), Japan (+3.4 %) and South Korea (2.3 %) 8 . We need to remain mobilised to address changing value chains, sustainability challenges, shifts in global demand as well as remaining structural weaknesses in our business environment. SMEs remain particularly vulnerable. Many people remain without the skills needed for the industry of the future, including basic digital skills. The increasing productivity gap between technology leaders and laggards hampers potential growth and undermines economic and social convergence as well as territorial cohesion. Europe's competitors are investing heavily in the upgrade of their industry; the investment rate in the EU has not yet returned to its historical average 9 . At the same time, the EU's innovation gap with some countries is increasing 10 and major economic players like China are starting to compete precisely in those higher added value segments where Europe does best. We therefore need to strengthen our industry's ability to continuously adapt and innovate by facilitating investment in new technologies and embracing changes brought on by increased digitisation and the transition to a low-carbon and more circular economy. But companies must do their part by upgrading the technology base, future-proofing business models, internalising sustainable development principles and embracing innovation. The industrial transformation provides enormous opportunities, but reaping them will require substantial investment in advanced manufacturing, people's skills and talents, as well as intangible assets like research and innovation. Accelerated transformation also requires a better functioning Single Market. With technology leading the way, a modern industrial policy can revitalise EU regions and build resilience to adapt to the changing global environment. The creation of jobs and growth through innovation and investment has since been at the centre of Commission's key initiatives including notably the Investment Plan, the Single Market Strategy, the Capital Markets Union, the Digital Single Market Strategy or the New Skills Agenda for Europe 11 . Putting in place the Energy Union, with its ambitious, forward-looking climate policy, the Circular Economy Action Plan and being at the forefront of implementing the 2030 Sustainable Development Goals also boost competitiveness and sustainable growth 12 . Horizon 2020 and the European Structural and Investment Funds are playing a major role in stimulating industrial innovation and the Commission is working with Member States in the context of the European Semester to implement national reforms supporting jobs, growth and investments. The reflection paper on the future of EU finances 13 has noted that the EU budget should continue to make the European economy stronger and more resilient. The Commission's cross-cutting policy on Better Regulation, which should be complemented by similar efforts by Member States at national, regional and local level, helps deliver better legislation and better results for society. High quality legislation provides the necessary certainty for businesses to thrive. ØBetter Regulation ensures that economic, social and environmental impacts are systematically assessed and it mainstreams competitiveness, innovation, digitisation, investment, SMEs, social and consumer protection and the environment into the EU’s policymaking. It aims to ensure that new legislation delivers its objectives at least cost and that existing legislation is checked periodically so that unnecessary red-tape is identified and tackled. ØIn parallel, the Commission’s programme on Regulatory Fitness continues to produce results through simplification of existing legislation and reduction of unnecessary costs 14 . The REFIT platform 15 and its linked website “Lighten the Load” also invite and review suggestions from businesses and civil society on how to simplify legislation. ØThe active involvement of stakeholders including businesses is crucial to help improve the quality of the Union's legislation 16 . The Commission thus invites stakeholder views at an early stage on its initiatives and evaluations. It also welcomes detailed evidence and inputs to its consultations as well as feedback on its proposals. The strong industrial focus of these policies has been complemented by sector-specific measures like in the case of steel, space and defence industries 17 , and through a strong focus on key enabling technologies. ØWith the Communication "Steel: Preserving sustainable jobs and growth in Europe", the Commission took steps to strengthen the EU’s defence against unfair trading practices. Action at EU and national level was proposed to address long-term challenges and sustainability of the European steel industry, notably through modernisation and investments in innovation (e.g. through public-private partnerships). ØTaking into account the strategic dimension of the space sector for Europe, the Commission adopted a "Space Strategy for Europe" in October 2016 to maximise the benefits offered by space for European society and economy, create the right ecosystem in Europe for space start-ups to grow, promote Europe's global leadership in space and increase its share on the world space markets. The time has now come to take stock of progress made and to address any remaining gaps. As evidenced in the European Parliament’s Resolution of 5 July 2017 18 and the European Council Conclusions of 15 December 2016 and 23 June 2017, as well as through the overwhelming interest and support from the broader stakeholder community, there is broad agreement on the need for a holistic and forward-looking vision for Europe’s industry. This will allow us to better act together, on the basis of the Commission's ten political priorities, to strengthen Europe's industrial base. Building on the European Industry Day earlier this year and the various input from stakeholders, this Communication responds to that need, formulating a strategy towards a smart, innovative and sustainable industry contributing to competitiveness, jobs and growth, for the benefit of all. The implementation of this strategy will require a joint commitment and systematic efforts on part of the industry as well as all relevant EU, national and regional stakeholders. ØThe first European Industry Day took place on 28 February 2017 and brought together around 600 participants from a large variety of industrial sectors and civil society from across the Union to discuss what the EU's industrial policy has achieved and what the future holds for the European industry. The discussions showed a broad consensus that the EU policies in place are helping to address the long-term challenges for the industry and helped map out the areas where further action was needed. We should therefore further strengthen the successful cooperation initiated at the first European Industry Day and make it a regular and structured feature. A deeper and fairer Single Market is at the heart of the success of Europe's industry. It must facilitate the integration of our companies in European and global value chains and act as an essential driver of industrial competitiveness. At the same time, it must help industry, people and local communities to adapt to social, economic and environmental change. The benefits of industrial transformation need to be widely spread and those who lose out must be able to find opportunities and support to adapt. Lifelong learning, equal opportunities and fair access to education, training and technological skills are at the heart of building such resilience. The Commission has put forward a host of measures over the past two years to allow Europe and its companies to reap the benefits of the Single Market. The European agenda on the collaborative economy 19 is stimulating the balanced development of collaborative business models which also have a considerable potential to drive resource efficiency in the economy. The modernisation of the standardisation system 20 will help develop timely and market-driven standards that allow our industries to reap opportunities in emerging market segments. This year's services package 21 is addressing disproportionate regulatory barriers, facilitating mobility of professionals and streamlining procedures that service providers have to follow when they expand their activities to other EU countries. Most recently, the compliance package 22 places a strong emphasis on enforcing Single Market rules and helping citizens and businesses to make the Single Market a tangible reality on the ground. To further strengthen the Single Market, the Commission will also propose rules to simplify the functioning of mutual recognition and revise the rulebook on market surveillance to ensure product safety and better assist the more than 500 national market surveillance authorities in the coordination and performance of their tasks. It will present a number of initiatives to modernise the intellectual property framework. To assist authorities to better use public procurement as a driver for smart, sustainable and innovative technology, the Commission will furthermore propose measures to boost strategic procurement and to assist Member States with procurement aspects of large infrastructure projects. To cope with the significant pressure the ongoing industrial transformation is putting on European industry and its workforce to adapt, particular attention needs to be given to build resilience and help people and communities to seize the opportunities of change. Education and training systems need to ensure that people are equipped with the right set of skills to drive such change and avoid widening social gaps. These skills need to be developed well before entering the labour market and updated throughout the working life. The involvement of key stakeholders, including social partners, is essential in that regard. The EU Skills Agenda 23 sets out ten key actions for better skills in Europe, ranging from initiatives to tackle the basic skills gap which affects more than 70 million adults in Europe, to measures which will support the development and anticipation of high level skills in emerging fields. The Commission, in co-operation with the OECD, is supporting Member States to develop National Skills Strategies. The Commission's forward-looking blueprint approach for sectoral cooperation on skills 24 will shortly be extended to further key industry sectors, such as construction, steel, paper, green technologies and renewable energies, additive manufacturing and maritime shipping. The digital skills and jobs Coalition 25 proposes concrete action to train and re-train European citizens and the labour force in the wake of digitisation. The recently launched European Pillar of Social Rights 26 addresses the future of work and the emerging digital labour market. Among others, it aims to tackle the challenges linked to new and non-standard forms of employment relationships, the conditions of work and access to social protection. The Commission will further strengthen the result orientation of the European Social Fund to support the resilience and competitiveness for labour markets. National labour market policies play a key role in anticipation of future skills needs and in the use of European Social Fund to better manage change and help provide relevant training. The Erasmus+ programme is also a key instrument developing new skills through learning abroad. The European Globalisation Adjustment Fund provides support to workers falling victim to major lay-offs caused by globalisation or the crisis. The future of industry will be digital. Digital transformation is at the core of the ongoing industrial revolution. Progress in technologies such as big data, artificial intelligence and robotics, the Internet of Things and high-performance computing is impacting the very nature of work and society as a whole 27 . With the advent of digital technologies, the service component of industry is becoming ever more important. Boosting the uptake of smart technologies along and across industrial value chains and promoting firm growth is therefore key to Europe's growth and competitiveness. Europe is a global leader in many manufacturing industries and its companies are often at the forefront of digitisation and automation in key industry sectors 28 . Europe's role in the data and platform economy is limited and the uptake of digital technology by SMEs is low 29 . Only a fifth of companies in the EU is highly digitised 30 . Companies in turn must do their part by shouldering the initial investment in digital technologies and then seize the productivity gains and innovation advantages they offer. Business models and processes may change; managers and staff may have to gain new skills; and the transformative pace may pick up. But forgoing digitisation will also bring change with the likely loss of competitiveness, market share and ultimately jobs, in the worst case threatening the existence of the firm itself. That is why the comprehensive strategy on Digitising European Industry 31 is placing strong emphasis on a wider digitisation of industry. The European Platform of National Initiatives on Digitisation launched in March put in place a European coordination framework and is stimulating digitisation policies in all Member States 32 . The Commission is also investing in the deployment of Digital Innovation Hubs and other technology centres to offer EU businesses more coordinated and better support services. This helps to reach out to those companies that are not yet engaged in the digital transformation. Digital industrial platforms (e.g. industrial internet and industrial data platforms) will help to bring together different technologies and applications, facilitating the development of new products, processes, and in particular as well new business and service models. The Commission is launching dedicated calls to support their development in a number of areas such as automation and collaboration in manufacturing, high precision farming, and energy. Many other initiatives under the Digital Single Market Strategy are pushing the digitisation of industry and modernisation of public services, including through actions on ICT standardisation 33 , public administration 34 , high-speed connectivity (including 5G) and the Internet of Things. But the mid-term review of the Strategy 35 shows that Europe needs to go further. The Commission will put forward under this mandate a number of further ambitious initiatives to give European industry the Digital Single Market it needs. These initiatives address issues like the development of the data economy, artificial intelligence and high-performance computing, which are critical for smart industrial eco-systems and big-data applications. The comprehensive cyber-security package adopted today 36 is an important contribution to address cyber-threats and further reinforces Europe's strength in data security and data protection. In particular, the initiative to set up a cybersecurity competence network with a European Cybersecurity Research and Competence Centre will support the development of industrial capabilities. This will also give added impetus to EU efforts to become a global leader in the development of next-generation digital technologies. The free flow of data initiative will boost the European Data Economy by delivering better and more competitive data services. State of the art digital infrastructure and harnessing appropriate spectrum resources are also essential both for the development of ground-breaking digital innovations such as additive manufacturing or automated driving, as well as for a wide roll-out of digitisation to all parts of our economies and to citizens. The EU and its Member States must provide the right framework conditions for such infrastructures to develop. In addition, with more than EUR 20 billion of expected financing of projects, the European Fund for Strategic Investments has already become an important driver for investments in digital infrastructure. Horizon 2020, the Connecting Europe Facility and the European Structural and Investment Funds are also investing heavily in the key digital technologies of the future 37 . Next-generation connectivity – especially 5G – is the foundation on which future business models will be built. Autonomous vehicles, the Internet of Things and countless other applications that future industrial strength will hinge on simply cannot be realised without faster and seamless internet speed. The efforts to expedite 5G adoption are formidable, but so are the potential rewards which can give European industry a first-mover advantage and global competitive edge. The EU pursues sustainable development in a cross-cutting way and is the driving force behind the Paris Agreement for climate action and the Sustainable Development Agenda for 2030. It is at the forefront of the global transition towards a low-carbon and circular economy. Europe must now capitalise on this leadership in all sectors and tackle increasing global competition in green production and clean energy technologies. Transformation of our companies towards more sustainable and resource-efficient business models not only helps protect the environment, but also provides competitive advantage by creating important cost savings 38 . It can create new jobs and opportunities for workers and entrepreneurs. In December 2017, the Commission will put forward a new series of actions on Circular Economy. This will include a strategy to move towards a circular plastics economy in Europe, including through fostering innovation and investments. A stronger development of the bio-economy can also help the EU to accelerate progress towards a circular and low-carbon economy improving production of renewable biological resources and their conversion into bio-based products and bio-energy. As EU companies are increasingly integrated in global supply chains, the transition towards a circular economy cannot be pursued in isolation. Given the strategic importance of raw materials for the EU manufacturing industry 39 , the Commission is implementing a wide range of actions under the EU Raw Materials Initiative and will continue to help ensure their secure, sustainable and affordable supply. Certain raw materials are particularly critical as they are of a high economic importance and are associated with a high supply risk. In parallel to this strategy, the Commission presents a revised list of critical raw materials for the EU 40 . The Commission already presented most of the legislative proposals to implement the Energy Union Framework Strategy and the Paris Agreement and is now focusing on delivering concrete actions to speed up their implementation. While the Paris Agreement is a global game changer, the nationally determined effort by countries differs. Therefore, to the extent that an uneven playing field will remain, sectors at risk receive free allocation of allowances under the EU emission trading system (ETS). EU climate policy also provides tools to directly support low-carbon innovation in industry 41 . The New Entrants' Reserve (NER) 300 Programme allocated EUR 2.1 billion to 39 highly innovative projects. For the period after 2020, ETS allowances are foreseen to be set aside for the creation of an Innovation Fund to support the large scale demonstration of highly innovative low-carbon technologies for energy-intensive industry, renewables, and carbon capture and storage. A Modernisation Fund will support energy sector modernisation in ten lower income Member States. In the Clean Energy Package 42 adopted last November, the Commission proposed a new framework to accelerate, transform and consolidate the EU economy's energy transition, at the same time ensuring EU leadership and competitiveness of our economy. The package will lead to increased competition in the electricity retail market and open it to new services and business models. It also sets out an enabling framework to support the transition to a low-carbon and circular economy through concrete and short-term measures to help bring tangible results to EU industry, regions, cities, workers and citizens alike. To help accelerate the market uptake of innovation worldwide, the EU will, together with the Nordic Countries, co-host a major global summit in 2018 - the Mission Innovation and Clean Energy Ministerial - with pledges from international partners representing 85-90% of global clean energy investment. Strong emphasis must also be placed on low emission mobility. Following the 2016 Strategy for low emission mobility and the spring 2017 Mobility Package 43 , the Commission will come forward this autumn with new proposals contributing to this objective, including for strengthened post-2020/2021 carbon dioxide standards for cars and vans and an Alternative Fuels Infrastructure Action Plan to support the deployment of an EU backbone charging infrastructure. For the EU to remain competitive in this field it will be necessary to fill missing links in relevant value chains. This is why investment in batteries is of strategic importance. To kick-start industry-led initiatives for a full battery value chain in the EU, both for mobile and stationary applications, the Commission will hold a stakeholder meeting 44 to help optimising possible public intervention. This will be followed by a proposal for carbon dioxide standards also for lorries, buses and coaches (heavy-duty vehicles) in the first half of 2018. ØA modern and competitive automotive industry is key for the EU economy, increasingly relying on automation, digitisation, and the highest level of environmental performance. The goal is to ensure that the best low-emission and connected mobility solutions, equipment and vehicles are developed, offered and manufactured in Europe and that we have in place the most modern infrastructure to support them. To that end the European automotive sector will need to undergo fast and profound change to remain competitive and thrive on the global market. The challenges laid bare by the Dieselgate are also opportunities: To restore confidence, the EU automotive industry must recognise the importance of a transition towards more sustainable technologies and new business models. Electric charging stations are being rolled out all over Europe and public authorities and the private sector are joining forces to upgrade Europe's capacities in battery technologies. Europe's car industry must respond to this challenge, gear up and accelerate the transition to electric and other low emission technologies. If Europe seizes this opportunity, this will mean sustainable jobs and better livelihoods for its regions and communities. The Commission is furthermore developing in the context of the Capital Markets Union a strategy on sustainable finance to better orient private capital flows to more sustainable investments. Better differentiation between sustainable and other investments will be key to integrate wider risks and returns into long-term investment decisions and increase the confidence in projects' implementation, disclosures and labels. Investment from within and outside the EU on both infrastructure and new technologies is a precondition for our industry to drive industrial transformation. While overall investment levels are gradually increasing, investment in innovation and other intangible assets remains lower than by many competitors. Europe needs to stimulate more capital investment, facilitate the uptake of promising innovation and provide a favourable environment for the scale-up of dynamic SMEs. Under the "Juncker Plan" – the Investment Plan for Europe – launched in November 2014, a European Fund for Strategic Investments was established to support strategic projects across the continent, thereby helping to close the investment gap. It has already succeeded in leveraging significant private investment into digital infrastructure, energy, research, transport, development and innovation projects, thus providing significant financing to the economy and supporting the recent upswing in investment. The European Investment Bank Group has also developed equity investments, which are particularly crucial for innovative companies in their early stages. ØBy July 2017, 572 transactions supported by the European Fund for Strategic Investments have been approved for a total investment value of EUR 225.3 billion (72% of the overall objective of EUR 315 billion by mid-2018). These transactions cover all Member States and are expected to benefit over 445 000 SMEs and mid-caps with more than 30% of the total volume. The Commission's proposal to revise and extend the European Fund for Strategic Investments (EFSI 2.0) foresees that 40% of the increase of the EFSI's risk-bearing capacity will be geared toward increasing access to financing for SMEs and the European Investment Bank will expand its share of financing for mid-caps. At the same time, the Commission proposal for an Omnibus Regulation will simplify the combination of EFSI with resources from European Structural and Investment Funds to achieve greater impact, including for investment platforms 45 . To ensure a highly competitive manufacturing sector in Europe, a successful strategy must build on Europe’s strengths and assets in strategic value chains in new technologies and make these more robust. This often requires joint, well-coordinated efforts and investments by public authorities and industries from several Member States. The Commission's Communication concerning Important Projects of Common European Interest (IPCEI) is designed for such strategic projects 46 . Examples of value chains of strategic importance for Europe include energy storage as well as electronic chips. Where used by Member States, they can play a vital role in promoting policies and actions in key areas for economic growth. To achieve a more proactive approach with Member States and industry with regard to Important Projects of Common European Interest, the Commission will establish a strategic forum involving key stakeholders to identify key value chains and investment projects and monitor progress achieved. Important progress is also being made with the Capital Markets Union and the Start-Up Initiative under the Single Market Strategy to ease access to finance for the first development phases of our innovative companies. The Capital Markets Union is facilitating investment for companies across the board through improved access to alternative financing sources. The rules of the European Venture Capital Funds have been revised so that they can finance a broader set of companies and the Prospectus Regulation has been amended to facilitate the raising of money for SMEs. A Pan-European Venture Capital Fund of Funds is being created to address the need for larger venture capital investments after the start-up phase. The Commission will now assess how EU legislation could deliver a more proportionate regulatory environment to support SME listing on public markets. Further initiatives will also be taken on financial technologies (FinTech), in particular to foster innovative financing tools such as crowdfunding, and to examine the possibility of developing European secured notes as an instrument for SME and infrastructure loans 47 . To further address the gap in financing the step from innovation into markets the Commission will explore setting up a complementary European Scale-Up Action for Risk Capital to enable venture capital funds to increase their investment capacity. Due to their different risk profiles and the scale or scope of their activities, certain sectors face more obstacles in accessing funding than others. The Commission is taking targeted action in sectors such as space and defence to help exploit new opportunities for different parts of the supply chain. With the European Defence Fund, the Commission has launched a key enabler for the future European defence sector. ØThe European Defence Action Plan 48 sets out concrete measures to support more efficient defence spending in joint capabilities and foster a competitive and innovative industrial base. This is done notably with the launch of a European Defence Fund and by strengthening an open and competitive defence market in Europe. The European Defence Fund has since started to deliver first results 49 , notably with the implementation of the Preparatory Action on Defence Research and the recent proposal for a European Defence Industrial Development Programme. Together with Member States' contributions to finance joint development projects, the Fund could in the medium term generate a total investment in defence research and capability development of EUR 5.5 billion per year. Improving framework conditions for investment, including regulatory predictability, fair competition and the rule of law, must also remain a key theme of the Commission's work with Member States on reforms in the European Semester as part of the third pillar of the Investment Plan for Europe. Greater efforts should be undertaken by national and regional authorities with fiscal space to support quality investment and close the investment gap accumulated since the crisis. EU and Member States' funds should be deployed as incentives to create added value in the economy without jeopardising the development of a vibrant private market for project financing. The Union ensures that State aid properly incentivises firms to invest in Research & Development – including the possibility to match aid received by competitors located outside the EU for similar projects – and other competitiveness-enhancing measures, and that selected companies are not given economic advantages which negatively affect competition and trade between Member States. Europe has excellent research results in many technology areas which directly or indirectly contribute to the development of a smart, innovative and sustainable industry. We need to raise our game in turning research into breakthrough innovation creating new markets that drive jobs and growth. At present, too few innovative firms succeed in scaling up to become major employers and market leaders. Europe needs to strengthen its enabling environment, to ensure that its risk-bearing disruptive innovations will create new markets and industrial leadership in Europe rather than outside. Action is also needed to accelerate and improve the uptake of technologies, particularly among SMEs and traditional industries. High growth firms and start-ups scaling up into bigger firms create more jobs than other firms. They innovate and strengthen our economy. Starting up is not a European problem 50 , but too few European start-ups are able to survive and grow longer term. It is the high-growth businesses that are able to scale-up which create durable jobs and economic growth and drive long term innovation. This is why the Commission's start-up and scale-up initiative 51 put forward a set of measures to make it easier to start-up and scale-up. Our start-ups and dynamic SMEs need access to risk capital and a favourable business environment to innovate and grow throughout Europe. They need help to connect with skilled people, technology centres and support organisations within and across regions to accelerate diffusion of knowledge and to integrate into global value chains. The European Institute of Innovation and Technology brings together leading businesses, universities, and research labs to reinforce Europe's innovation capacity. The Commission is also facilitating a dialogue on cluster policy excellence 52 and taking action to facilitate the integration of creativity, design, and non-technological innovations with cutting-edge technology to generate new products, new industrial value chains and revitalise traditional industries 53 . Progress is needed at all levels to ensure that our regulatory frameworks provide the necessary flexibility to allow innovation to develop. We must learn to consider the perspective of innovators as they often have less of a voice than incumbents. To this end, the Commission will apply the innovation principle through its Better Regulation Agenda. The innovation principle entails taking into account the impact on research and innovation in the process of developing and reviewing regulation in all policy domains, i.a. to ensure that EU regulation allows companies to enter markets more easily. Our competition policy is an important driver for firms to innovate and invest. There is a strong link between the degree of competition and increased productivity, which in turn ensures long-term sustainable economic growth. Competition policy ensures that firms can source their inputs at optimum conditions and benefit from competitive outlets for their products, thus leading in general to a better use of society’s resources. The Commission’s recent proposal to empower National Competition Authorities aims at further strengthening effective enforcement at all levels, given that national authorities make around 85% of all decisions that apply the EU antitrust rules. This Commission has also been pushing very strongly for tax fairness and simplification 54 . The recently re-launched Common Consolidated Corporate Tax Base is moreover providing important incentives for businesses to innovate and expand. On Value Added Tax – an area that is consistently ranked as one of the most burdensome areas of legislation 55 – the Commission will still this year make proposals to considerably simplify the obligations for enterprises and set out the pathway to the creation of a single EU VAT area. In terms of the Union’s own financial support for innovation, the 2018-2020 Work Programme for Horizon 2020 is endowing a European Innovation Council Pilot with a budget of over EUR 2.6 billion to more effectively support projects focused on market-creating innovation. Moreover, EUR 2.2 billion are being set aside in priority areas 56 to accelerate clean energy innovation. The main target groups are innovators and companies with high potential to scale-up and which cannot raise sufficient private investment. The European Innovation Council Pilot aims at creating a new standard of excellence for highly promising but also potentially risky innovations, helping to concentrate support at EU-level. We also need to ensure leadership in the strategic technologies for the industry of the future. A High Level Group on Key Enabling Technologies will review key enabling technologies and the best possible ways to maximise their industrial deployment 57 . Open and rules-based trade is an essential part of our efforts to harness globalisation. The EU is using its weight to promote a global level-playing field in bi- and multilateral trade negotiations where this has become ever more important. EU trade deals create economic opportunities for Europeans and that means jobs 58 . Small companies as well as big ones use trade agreements to bring the benefits of globalisation back home 59 . But open trade must be fair and sustainable. Strengthened trade defence instruments and a new enabling framework to screen foreign direct investments that may pose a threat to security or public order will help ensure that Europe operates on a global level playing field. The EU has an ambitious trade agenda with a number of negotiations under way or recently concluded. Notably, the EU-Canada agreement, provisionally applied as of 21 September 2017, will remove 99% of tariffs, remove barriers to services trade, and give EU companies better access to Canadian procurement market than to any other of Canada's trading partners. Also, this past July, the EU and Japan – the world’s second and fourth largest economies respectively who together account for 22% of world trade – reached political conclusion on an ambitious agreement, sending a clear message at a time of increasing protectionist tendencies elsewhere in the world. EU Trade defence instruments help ensure EU companies fair competition and the Commission makes full use of the current means to react to unfair trading practices. Once adopted by the co-legislators, the two Commission proposals on the modernisation of trade defence instruments 60 and on a new anti-dumping calculation methodology 61 will make these means even more effective in tackling significant market distortions. In the area of public procurement, many of the EU's major trading partners still apply restrictive practices which discriminate against EU businesses and do not ensure reciprocity in terms of market access. The Commission therefore calls on a swift adoption of its revised proposal for an International Procurement Instrument - a tool to promote open and reciprocal access to public procurement markets around the world. EU rules must also adapt to increasing challenges of global competition, such as concerns that European companies with key technologies are taken over by foreign investors, notably State-owned enterprises, for strategic reasons. The Commission is therefore proposing today an enabling framework for Member States to screen foreign direct investments that may pose a threat to security or public order, as well as a cooperation mechanism and a framework for screening at EU level 62 . Like the present Communication, this enabling framework is an important element of follow-up to the Commission's reflection paper on harnessing globalisation. While the EU is improving the framework for jobs, growth and innovation, most tools to stimulate and support industrial competitiveness are available on the national and regional level. The ambition to strengthen European industry at EU level therefore needs to be matched by national reform efforts, taking into account specific national and regional differences. The Commission will continue its work with Member State in the European Semester to deliver on the main needs for industrial competitiveness, such as in particular improved framework conditions for investment, productivity-enhancing resource allocation and an improved business environment. Product and service market reforms should help facilitate seamless mobility and value chain integration across geographic and sectoral borders. Labour markets and social systems need continued reform to perform for our people and foster innovation and adjustment by providing security and support and allowing them to take risks, participate in education, training and lifelong learning, acquire the qualifications they need and adapt to changing tasks, career patterns and work-lives. The new Structural Reform Support Programme allows hands-on assistance in the implementation of structural reforms in the context of the European Semester and for specific reforms of their research and innovation systems Member States and regions can also rely on the Horizon 2020 Policy Support Facility and the Smart Specialisation Platform. The Commission will appoint "investment envoys" in the Member States that serve as a contact point to national and regional authorities, project promoters, investors and civil society on related investment matters. The Commission will launch a Pilot action to provide tailor-made and joined up support to address the specific challenges of regions going through an acute crisis or falling into decline. In close co-operation with Member States and their regional and local authorities, the initiative will seek to overcome barriers to growth by helping regional economies to transform and diversify into new, sustainable economic sectors projected towards the future. More generally, the EU plays an important role in empowering regions and municipalities to address challenges and learn from each other rather than applying a one-size-fits-all approach. It provides the means to Member States and regions to cater for their specific transformation needs through smart specialisation. The recent Communication on strengthening innovation in Europe's regions 63 highlights ways to maximise Europe's potential with smart specialisation in cooperation between EU, national and regional level such as in the Platform for industrial modernisation 64 . Further action is needed to facilitate deeper strategic inter-regional collaboration along industrial value chains. We need to strengthen the abilities of local communities to cope with and adapt to social or economic change. The experience of social entrepreneurs and innovators shows how to build social resilience within communities, by addressing specific societal needs, and generating economic activity and employment at the same time. Corporate social responsibility is also important for achieving sustainability and, in light of changing consumer preferences, helps make companies more competitive and innovative. A strong dialogue between industry, trade unions and other stakeholders helps anticipate change and adapt to the future needs. The first European Industry Day in February 2017 was the start of a comprehensive dialogue with all stakeholders. We will build on this to establish an open and inclusive forum to encourage cooperation and monitor progress in implementing the EU Industrial Policy Strategy. This process will also build on reflections from existing groups linked to EU initiatives in the area of industrial policy 65 . For example, in 2018, the European Industry Day will, inter alia, discuss technologies of the future on the basis of the work of the High Level Group on Key Enabling Technologies 66 and contribute to the agenda of the Strategic Forum for Important Projects of Common European Interest. There is a considerable degree of agreement among Member States, the European institutions and the relevant stakeholders, including the leading voices of the European industry, about the need to join forces behind a comprehensive and holistic strategy for industrial competitiveness and about the main elements such a strategy should entail. 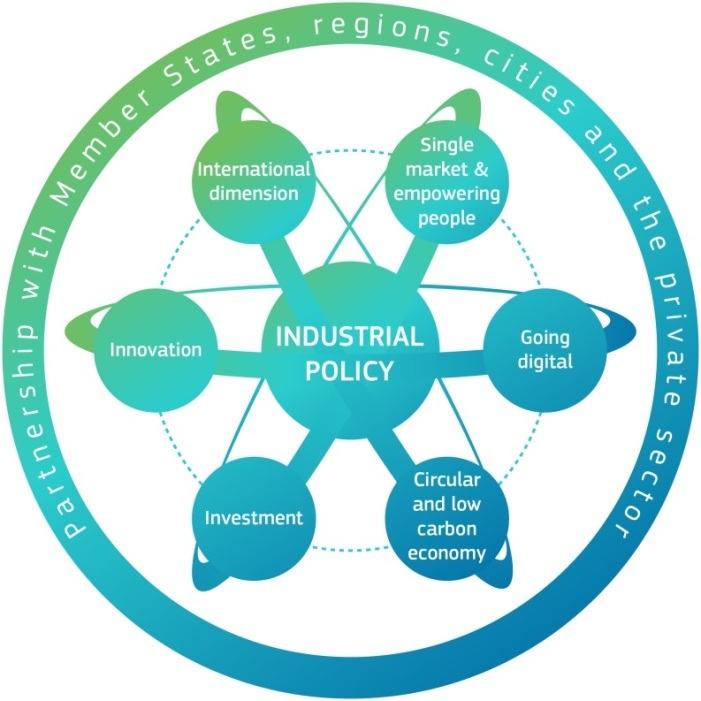 This Communication outlines the main direction and priorities of that comprehensive industrial policy strategy – a strategy that empowers industries to create jobs and growth, that defends its regions and workers most affected by industrial change and that reinforces and protects Europe's leadership role, competitiveness and technological cutting-edge. The strategy provides an important point of reference and will enable a more coherent approach in the way we design, develop and implement our policies, regulation and financial programmes. While important steps have been taken, a lot more remains to be accomplished in order to put the strategy fully in place and to allow industry and our citizens to embrace the opportunities of the future, across all EU regions. The responsibility for this is a shared one relying on the efforts, cooperation and ownership of the EU institutions, national and regional actors and most importantly on the active role of the industry itself. An open, inclusive and collaborative dialogue forum is needed to monitor progress of this Industrial Policy Strategy and identify further action needed on all levels (international, EU, national, regional, local). All relevant stakeholders should have the possibility to contribute to that process. The Commission will organise an annual Industry Day involving all relevant stakeholders ahead of the Spring European Council to ensure that our policies at European, national, regional and local levels work together to enable European industry to deliver jobs, growth and innovation in Europe and to highlight new emerging industrial, societal and environmental trends that may need a policy response. The Commission will present the conclusions of the industry day to an a High Level Industrial Roundtable to be set up in 2018 with representatives of national, regional and local authorities, industry, social partners and civil society. The High Level Industrial Roundtable will provide feedback on the Commission's initiatives and actions, and advise on the implementation of industrial policy at different levels. The European Industry Day and the High Level Industrial Roundtable will play an important role in ensuring that industrial competitiveness objectives are strongly reflected in policies at all levels. In order to provide the necessary momentum, the Commission will continue to work closely with the European Parliament and looks forward to the European Council regularly taking stock of progress in this regard. These figures include manufacturing, extractive industries and utilities industries. They exclude business services and construction, which are however closely linked to EU industry, not least against the backdrop of the growing role of value chains and of servitisation. See the Commission's reflection paper on harnessing globalisation, COM(2017) 240. References to EU27 throughout the text refer to the European Union without the United Kingdom. As above, (FN 1), these figures exclude business services and construction. OECD data based on the number of persons employed. The average investment rate 1996-2007 amounts to 21.4%. Such as South Korea and Japan. See European Innovation Scoreboard 2017. COM(2014) 903; COM(2015) 192; COM(2015) 468; COM(2015) 550; COM(2016) 381. COM(2015) 80; COM(2015) 614; COM(2016) 739. The REFIT scoreboard: https://ec.europa.eu/info/law/law-making-process/overview-law-making-process/evaluating-and-improving-existing-laws/reducing-burdens-and-simplifying-law/refit-making-eu-law-simpler-and-less-costly_en . For example, the new VAT one-stop-shop for online sales and the harmonised general data protections rules which replace 28 national rules are each expected to save businesses an estimated EUR 2.3 billion per year. Contribute to EU law making at: http://ec.europa.eu/info/law/better-regulation/have-your-say_en . COM(2016) 155; COM(2016) 705; COM(2016) 950. European Parliament Resolution of 5 July 2017 on building an ambitious EU industrial strategy as a strategic priority for growth, employment and innovation in Europe. COM(2016) 820; COM(2016) 821; COM(2016) 822; COM(2016) 824. COM(2017) 255; COM(2017) 256, COM(2017) 257. The blueprint is being piloted in six sectors: automotive, defence, maritime technologies, textile, clothing, leather and footwear, space, and tourism: https://ec.europa.eu/growth/industry/policy/skills_en . The combined economic impact of the automation of knowledge, work, robots and autonomous vehicles is estimated to reach up to EUR 12 trillion annually by 2025, including gains in productivity. See COM(2017) 228. Europe has a world market share of 33% in robotics, 30% in embedded systems, 55% of automotive semiconductors, 20% of semiconductor equipment and 20% of photonics components. According to a Roland Berger study on digital readiness of industry, around 60% of large industries and more than 90% of SMEs are lagging behind in digital innovation. Europe's Digital Progress Report, SWD(2017) 160. 15 Member States have already launched national initiatives, six initiatives are in preparation. The aim is to reach all Member States by the end of the year. JOIN(2017) 450; COM(2017) 476; COM(2017) 477; COM(2017) 478; COM(2017) 489; C(2017) 6100; COM(2017) 474. Such as microelectronics, photonics, robotics, cloud computing and artificial intelligence. Horizon 2020 foresees investments in key digital technologies of EUR 3.4 billion. The European Regional Development Fund invests over EUR 17 billion in the digitisation of industry, public administrations, education, broadband, digital research and innovation and the roll-out of digital solutions. The other European Structural and Investment Funds are investing an additional EUR 4 billion in rural broadband and e-skills. Since 2000, and as a result notably of European initiatives and legislation, European industry has cut its energy intensity twice as fast as the US. Bearing in mind that energy is an important cost factor in Europe, this has led to improvement of EU's competitiveness. At the same time, industrial competitiveness is boosted by energy efficiency improvements in industrial processes and plant operation. Ecodesign requirements set for products used in the industrial processes and for equipment decrease energy consumption and energy costs for industry. The New Entrants' Reserve (NER) 300 Programme allocated EUR 2.1 billion to 39 highly innovative projects. For the period after 2020, ETS allowances are foreseen to be set aside for the creation of an Innovation Fund to support the large scale demonstration of highly innovative low-carbon technologies for energy-intensive industry, renewables, and carbon capture and storage. A Modernisation Fund will support energy sector modernisation in ten lower income Member States. In addition, the Clean Energy Industrial Forum will also support industry to take advantage of new growth opportunities in the areas of renewables and construction. Like the dedicated fund in Nord-Pas-de-Calais bringing together the European Regional Development Fund, EFSI and private actors: "http://www.eib.org/infocentre/press/releases/all/2015/2015-237-nord-pas-de-calais-15-meur-dans-un-fonds-dinvestissement-dedie-a-la-troisieme-revolution-industrielle.htm. The EU provides State aid rules (Official Journal C 188 of 20 June 2014) specifically designed to encourage Member States to channel public funding towards such integrated projects which have clear spill-over effects for a wider part of the Union such as on Key Enabling Technologies: KETs are knowledge intensive and associated with high R&D intensity, rapid innovation cycles, high capital expenditure and highly-skilled employment – COM/2012/0341. See for a more complete overview the mid-term review of the Capital Markets Union Action Plan, COM(2017) 292. 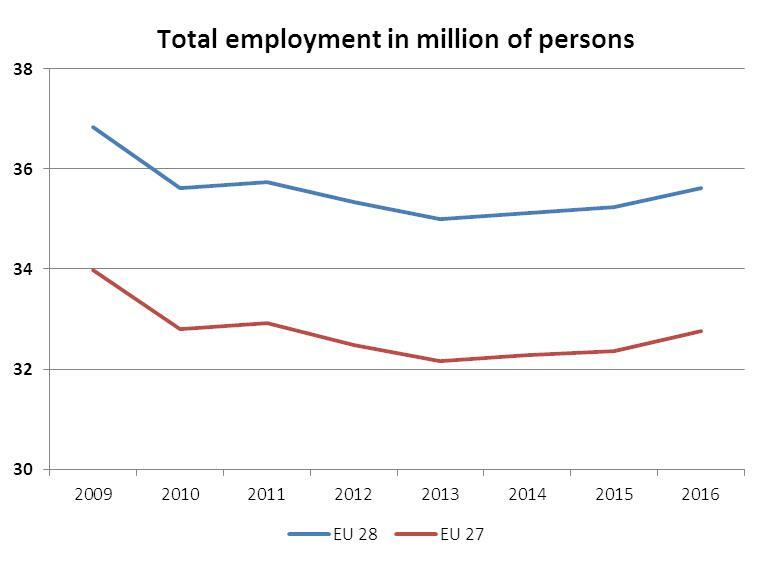 According to Eurostat, 2.6 million new enterprises were created in the EU in 2014 generating almost 4 million new jobs. In 2018, the Commission will establish a High-Level Expert Group on Clusters to provide recommendation on how to better use clusters as a strategic tool of industrial policy. The group will be supported by the work of the European Cluster Policy Forum under the European Observatory for Clusters and Industrial Change as announced in the Smart Specialisation Communication. The Commission is supporting the creation of incubation networks for creativity-driven innovation and partnerships (among creative people, traditional manufacturing, IT and science) through COSME, the Creative Europe programme and its Cultural and Creative Sector Guarantee Facility Fund, the European Fund for Strategic Investments and the Structural Funds. The Commission will take steps to strengthen links and coherence among these different instruments. The Commission has put forward a series of measures to tackle aggressive tax planning. This includes new transparency rules for intermediaries that design and promote tax planning schemes. Moreover, Member States are now obliged to automatically exchange an extensive amount of information on income and capital held by individuals and entities abroad. Decarbonising the building stock, renewables, energy storage, electro-mobility and urban transport systems. The Key Enabling Technology concept has been widely used to shape policies and funding programmes under the current Multiannual Financial Framework. In light of the far-reaching and fast changes in the industrial and technological environment, the Group will review the list of identified technologies, advise on how to maximise the industrial deployment and on how to maximise the benefits for the European economy, society and citizens. 31 million jobs in the EU depend on our exports to the world. The EU is in that context strengthening the monitoring and implementation of trade agreements through the Market Access Strategy. See for example the Trade and Investment Barrier Report, COM(2017) 338, showing that in 2016 a total of 20 existing trade barriers – including several long-standing ones – were resolved in several sectors in twelve different countries around the world, creating significant additional export opportunities. The Commission will i.a. launch a Pilot action to provide tailor-made and joined up support to address the specific challenges of regions going through an acute crisis or falling into decline. In close co-operation with Member States and their regional and local authorities, the initiative will seek to overcome barriers to growth by helping regional economies to transform and diversify into new, sustainable economic sectors projected towards the future. Including, for example, the European Platform of National Initiatives on Digitising Industry. Commission Expert Group: "Horizon 2020 High-level Strategy Group on Industrial Technologies"
This Annex provides a non-exhaustive overview of key actions for a smart, innovative and sustainable industry and sets out the next steps towards their implementation, the timeline for the next steps as well as the main players concerned.